We want to take this opportunity to sincerely hope that everyone had a great holiday and look forward to what 2013 will bring us all. 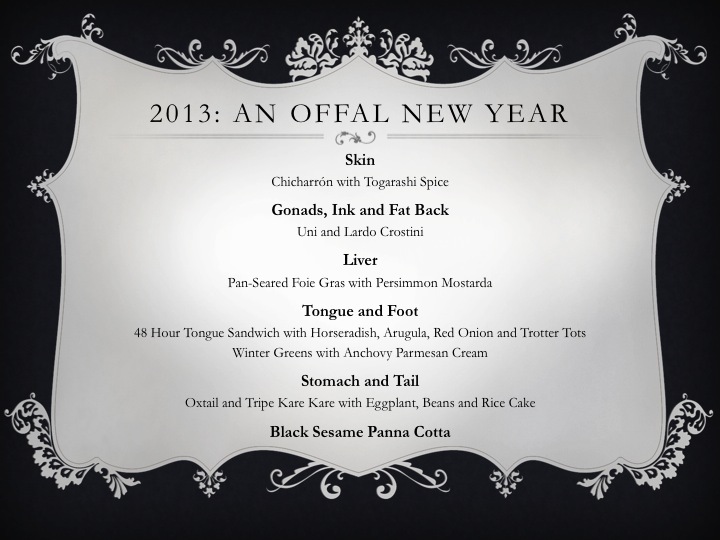 For our New Year’s Eve dinner this year, we decided to stay in and cook up a feast: an offal feast that is. We have excellent friends where in lieu of Christmas gifts, we give each other a themed meal to remember every year. This year’s theme for us was “offal” because we wanted to challenge our friend’s palate and rid her fears of animal parts unknown. We strongly believe in the philosophy of eating head-to-tail as part of paying respect to the animal that nourishes us carnivores. Offal is usually thought of as organs, but it can also mean other parts of the animal usually discarded after butchering. Although this particular meal used less desirable cuts from animals, it was meant to be a very nice multi-course dining experience. All in all, the dinner was considered a success where our guest even chose to bring some of the leftover tongue and trotter tots home with her. We could have chosen more awful offal but decided that we would reel her in slowly then continue the challenge over the next year. It was a great way to start an Offaly Great New Year. Note: we did not post any step-by-step recipes in this post, but we may in future posts, or send on any on request. I’m onest with you, I don’t like offal parts, although I have never taste them (except for “ciccioli” – crunchy chip-like fatty leftover pieces of pork), but you know, I think that is because my mom doesn’t like them and in some ways she has affected me, so I’m feeling like your friend, but I have to tell you that you did really an amazing job!!! They were absolutely not simple dishes to make, you had to pay attention and care a lot to obtain the final result and you were able to combine perfectly the “senses” in every dish, so good job!!! And you have to believe me that I certainly would have liked to taste them! Ilaria, Thanks very much for the nice compliments. We will need to take you on an offal challenge as well. Italy has so many great offal dishes. One of the best examples we had was the Finanziera at Antica Corona Reale in Cervere – maybe you can try that one day if you are ever in Piemonte. Many of the lesser cuts like oxtail and tripe do require longer cooking times to break down the muscle tissue. But in the end, it is all worth it since it becomes very tender and tasty. Hopefully one day you will agree. My mother in law makes the best Trippa/Tripe ever (told by everyone who eat it), so one day I’ll ask her the recipe and write it on the blog.